Check out this crazy cupcake table! I received this link from reader Kris. This table is made by a company called Jellio. The 16" high, 24" diameter coffee table is available in nine fun colors. Jellio also makes other unique furniture, including a cupcake seat. 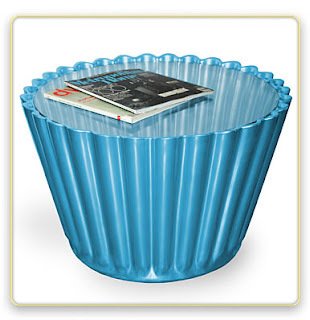 Cupcake table=great idea! $750=bad idea! How CUTE is that! You are right on about that whoppin price though! EEEK! Pleasant service as well as variable high quality outdoor furniture company products! I love to arrive as well as site more regularly anytime I receive a way for more furnishings requirements!